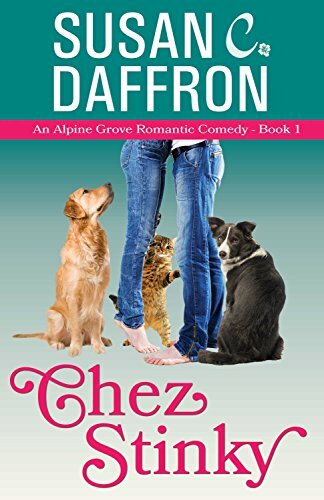 Susan Daffron is the author of the Alpine Grove Romantic Comedies, a series of novels that feature residents of the small town of Alpine Grove and their various quirky dogs and cats. She is also an award-winning author of many nonfiction books, including several about pets and animal rescue. She lives in a small town in northern Idaho and shares her life with her husband and three really cute fuzzy dogs. Kat Stevens is a slightly insecure, mostly bored technical writer who likes her cat a lot more than her boss. She hasn't laid eyes on her great aunt Abigail since she was eight, so she's stumped when she inherits Abigail's house in the small hamlet of Alpine Grove.Kat's uncomplicated life gets decidedly less so when she discovers the inheritance comes with some hairy conditions: four dogs and five cats that her aunt wanted her to love as her own. Of course, the house smells like a barn--with a touch of antique skunk--and, naturally, has serious roof issues. And that's before the three-legged cat gets stuck in the wall and the shower goes kablooey.